Do you fully understand the financial impact that divorce will have on you? Your children? Do you know what is “fair” or what your financial needs will be post-divorce? 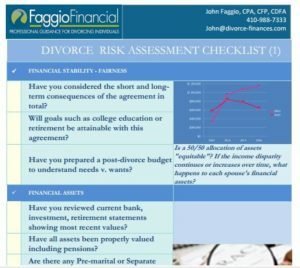 Our checklist was developed to help you address the critical financial issues that are prevalent in most divorces. Complete the form on the right side of this page and click on the link to receive immediate access to our downloadable Divorce Risk Assessment Checklist. Please complete this form to receive your copy.